Whether you’re fresh out of school or thinking of leaving your current job, knowing how to prepare for an interview is a must. Going for an interview can be extremely daunting but being well-prepared and well-dressed is a good start. Sweaty palms and butterflies in your stomach aren’t necessarily a bad thing – it means you really want it. But don’t worry, just follow our top 10 tips on how to prepare for an interview and thank us later. Get a good night’s sleep and have a decent meal before your interview – make sure you are the best version of you there is. You don’t want to be dozing off or your stomach grumbling during the interview. Make sure you can defend everything you’ve written – for example, why you left a previous job, the grades you achieved at your A-Levels. Think about when Claude Littner used to grill people on The Apprentice. You do not want to be in a situation where you can’t justify or explain a statement on your CV. This will help you to recognise exactly what the employer is looking for so you can tailor your answers accordingly. Have a bank of examples of things you have done already that tick the boxes in the job description to prove you are the best candidate for the role. If you are sitting in a journalism job interview, then be sure to bring your portfolio having carefully selected the most relevant pieces of work to this job’s requirements. It’s actually best to arrive early enough to find the exact location of your interview and to give yourself enough time to calm down. Depending on where you are waiting, it is also a good opportunity for you to get a feel for the place and the type of environment it has to offer. Arriving flustered because you’ve run from the bus stop is not a good look. Also, some places monitor waiting room behaviour. Manners go a long way so make sure you knock before you enter and close the door before you sit down. Don’t expect them to know who you are, they are probably interviewing a lot of people – so, introduce yourself and shake everyone’s hand. And dress smart – there’s no such thing as being too formal for an interview. You should always come across as positive, enthusiastic and engaged throughout your interview. Also, don’t slouch, yawn or fold your arms – stay calm and alert, sit up straight and make eye contact with everyone. It is ok to bring a bottle of water but do not eat or chew gum. Also, look up who is interviewing you and make sure you know their names, job titles and what they do. 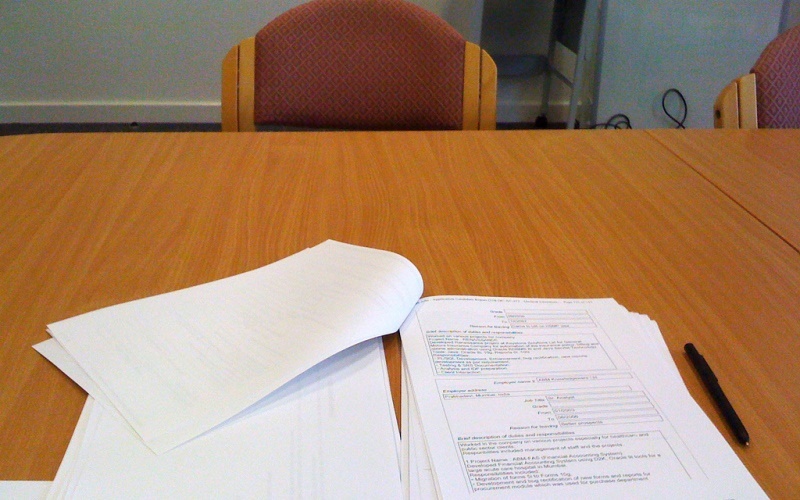 And make sure you know the format of your interview – for example, will it be one-on-one or in a group? If you don’t know, it’s ok to ask. Don’t be afraid to take some notes with you – make sure you don’t just read from your notepad but it’s ok to have some pointers you’d like to remember. You can also take a few notes on what the interviewer says – this will make you look interested. You’ll often get asked if you have any questions at the end of your interview. It will make you look disinterested if you have nothing to say about the job, or the company. So prepare a few questions in advance. The final thing you say will leave a lasting impression so try to finish on something positive. Do you have any other great tips on how to prepare for an interview? Share your experiences (and horror stories) below.